Prince Edward Island is the smallest province in Canada. Not to be confused with the frozen Antarctic Prince Edward Islands, Prince Edward Island is covered in rolling green hills, beautiful reddish sand beaches, looking very much like a Canadian Garden of Eden. In fact, Prince Edward Island is called the Garden of the Gulf, due to both its beauty and its location in the Gulf of St. Lawrence where it gets both the Arctic winds and the Atlantic- currents, which combine to make for a mild climate during the summer and much of the year. There are only two urban areas on Prince Edward Island: the capital, Charlottetown, and Summerside, a much smaller urban center. Charlottetown has a large green space within the city itself which is the last of the old, mandated pasture lands. This means that people in Charlottetown are never far from nature. Two suburban towns, Cornwall and Stratford, are a short distance from Charlottetown and beyond that most of the main island is pasture land. Charlottetown Harbor and Summerside Harbor are both rias—river valleys that have been flooded by the ocean. The ria in Charlottetown Harbor branches in a few directions, half-surrounding the city with water. On either side of the water are Cornwall and Stratford. These areas, together with Charlottetown and its suburban outgrowths, are where more than half of the population lives. The water glimmers in the sun like glass on Charlottetown’s beaches. In the evening, you may catch a beautiful sunset. Even in the winter, the beaches are beautiful. They have an eerie sense to them, with the water gently lapping the beach, which is dotted with stark trees. Near Charlottetown, you can see the hulking foundations of an old bridge. They look like a bunch of rock formations, but they were actually put there years ago by human hands. Nowadays, people take the modern bridge across to Stratford. Summerside Harbor’s ria doesn’t reach around the city quite like it does in Charlottetown, but it still has beautiful beaches and there are several places to rent kayaks and open-air places to eat near the harbor. In springtime, the land comes alive with green and flowers. The water is a startling blue, and the grass really is greener on this side of the fence. Prince Edward Island’s provincial flower is the Lady’s Slipper, which is a rather pink color; its petals look like a small, pink lady’s shoe. It can be found in various places on Prince Edward Island. Meanwhile in other areas such as the North you can find lighthouses, thick, grassy knolls, salt marshes, ocean coves, and dunes. It’s a nature lover’s paradise. Most people visit Prince Edward Island for its natural beauty, though eco-tourism is not all that the island has to offer. There are many beaches, golf courses, local festivals and events, tours of the island, and many other activities. The Prince Edward Island National Park is a protected bird habitat as it’s home to the endangered piping plover. It’s also full of wetlands, broad beaches, and several important land marks. If you wander around the park, you will see many sand dunes with grass growing on just one side. The grass quickly changes to the beautiful beaches that the park is known for within a few steps. The wetlands are a sight to see. They’re not mud-holes but rather expanses of blue water reflecting the sky, with greenery thriving throughout. Sometimes you can even catch a glimpse of a fish with its silvery scales flashing in the sun. Fishing is a time-honored tradition on Prince Edward Island. Some of these wetlands are tidal or saltwater, which are among the most productive environments in the world. Many, many creatures rely on these wetlands for survival. 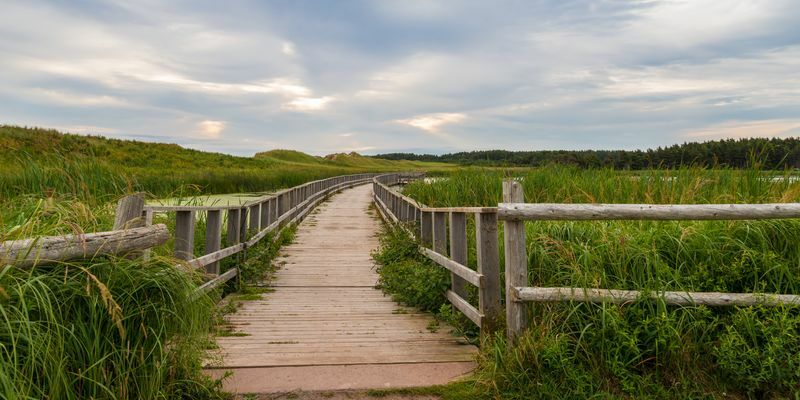 There are also wooden boardwalks and trails with informative signs telling the hiker about the Prince Edward Island National Park and what’s in it. There are many animals in the park and the island, though not many large predators. If you’re lucky, you may catch a glimpse of a red fox or a blue jay. Beavers also populate the island, as well as the striped skunk and the weasel. The Canadian goose can be seen on Prince Edward Island at the right time of year, and there are many ducks, especially diving ducks. You may also see snowshoe hares, the only native member of the rabbit family on the island. The hare can be hard to spot as its fur changes throughout the year to match its environment, and it’s white as snow in the winter. Speaking of winter, if you enjoy snow, Prince Edward Island is the place to be in the wintertime. The temperature doesn’t drop as low as many parts of Canada, but Prince Edward Island still gets plenty of snow from being near the ocean. There are also some forests on Prince Edward Island, especially in the park area. While there’s a good chunk of the province that’s wetlands and ponds, there’s also solid ground to put your feet on. Prince Edward Island, despite its name, is not just one island. It has several islands that belong to the province, and it’s the only Canadian province that doesn’t have any land boundaries. There are about twenty islands, all fairly small. They include Governers Island, which is triangular and privately owned, and Panmure Island, which has Prince Edward Island’s oldest wooden lighthouse. Prince Edward Island is a beautiful place to both live and visit.